Festivalgoer poses during the Coachella music festival in Indio, Calif., on April 14, 2018. Fun fact: It is April 17, 2018, and in New York City, temps aren’t expected to reach 50 degrees. In Chicago? They’ll be lucky to hit the low 40s. 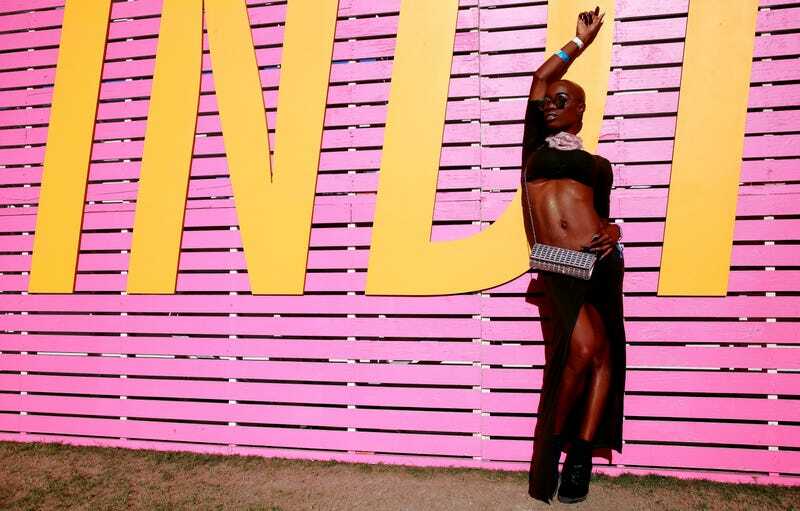 So excuse me if I couldn’t help starting to drool while checking out the festivalgoers during the first weekend of Coachella, basking in the glow of the Indio, Calif., sunshine—and the natural light that comes from being within 1,000 yards of Beyoncé, of course. Anyone who’s even remotely familiar with festival season knows it’s not only about the music; it’s an atmosphere for freedom and self-expression, so much so that it’s garnered its own highly profitable segment of the fashion industry. And Coachella, one of the most popular festivals worldwide, is understandably also one of the most anticipated when it comes to scouting festival fashion. But though the history of music festivals may evoke visions of flower crowns, tie-dye and bohemian rhapsodies, these days the looks run the gamut. This year’s recurrent trends included bared midriffs (for all), highly coordinated athleisure looks, gratuitous designer logos, head-to-toe pattern, and lots and lots of skin.